The Managing Director, MESCOM, Mangaluru, Chikkananjappa on Tuesday inaugurated solar roof top PV plant at the indoor sports complex. 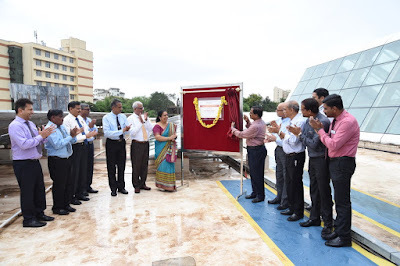 With that, Manipal University now has eight buildings with roof top solar plants. This has helped the University to achieve 55% of energy-demand from a green source. It may be mentioned here that Manipal University is ranked the second green campus in the country. “This substantially reduces dependence on conventional energy sources, thus mitigating carbon emissions and making a significant shift towards sustainable energy use,” said Dr H.S Ballal, Pro Chancellor Manipal University in an interaction with Chikkananjappa after the inauguration. MESCOM MD was appreciative of the initiatives being taken by the University to reduce pollution by using more and more of the solar energy. “Manipal University has partially shifted from the conventional energy use to renewable energy use and sourcing. This is being achieved by installing solar photovoltaic rooftop systems on the buildings with a total installed capacity of 817 kilowatts peak (kWp) connected to grid for self-use generating 12 lakh units on average per annum,” said Derrick Joshua, Environment Executive of Manipal University. Shridhar Rao, Executive Engineer (Electrical), Energy Lead Auditor and MR said, “This translates to carbon emission equivalent (Co2e) reduction of 984 metric tonnes. It substantially reduces dependence on conventional energy sources, thus mitigating carbon emissions and is a shift towards sustainable energy use. Adoption of the combined strategy achieves Co2e emission reduction of 25,320 MT per annum”.